Geohot's Towelroot exploit made rooting the Galaxy S5 so easy that it was almost unreasonable not to try it out—even for the first-timers out there. This, of course, meant that folks who didn't truly need root for their usage went ahead and got Superuser privileges anyway. Maybe you just wanted to uninstall a few bloatware apps, and after that, you decided you don't need root anymore. Or maybe you need to return your device to the manufacturer for warranty purposes. Whatever the reason, it's almost as easy to unroot as it was to root in the first place, and we've got you covered here. Note: While I'll be unrooting my Galaxy S5, this method should work for all Android devices. If you followed my guide to achieve root in the first place, you should already have SuperSU and the updated binaries installed. If this is the case, you can skip directly to Step 3 now. If not, you'll need to take care of both prerequisites before you can go about unrooting your phone. Search SuperSU on Google Play to get the app installed, or tap this link from your Galaxy S5 to head directly to the install page. 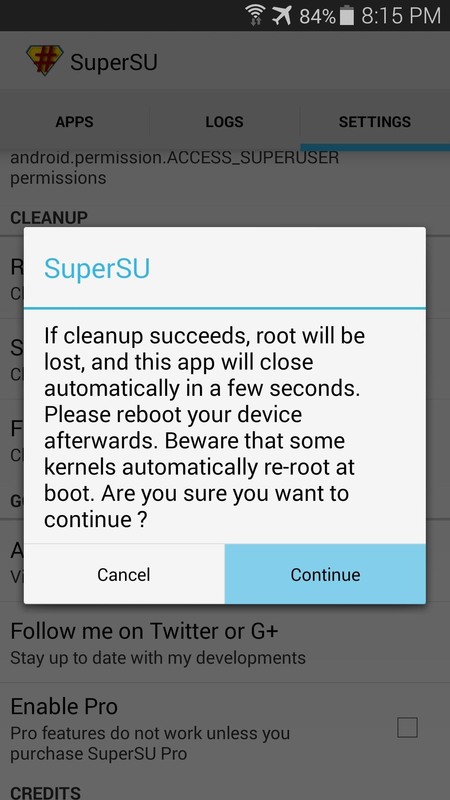 This is another step that was covered in my root tutorial, but if you didn't install SuperSU or if you used a different guide, you'll have to take care of this first. 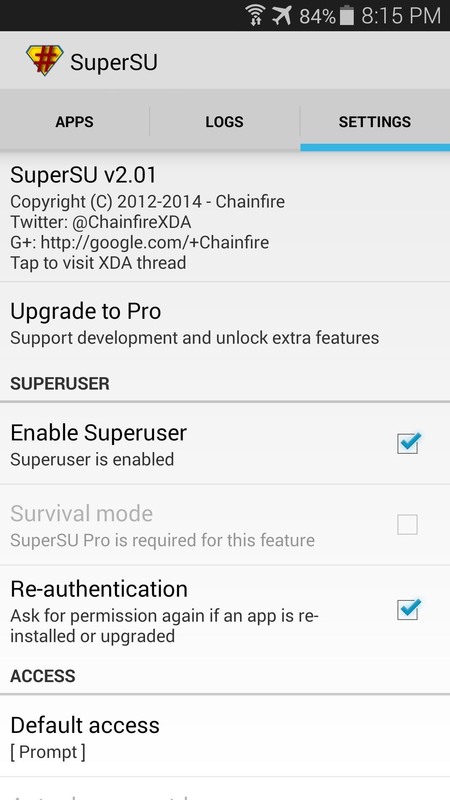 SuperSU is the app that you'll be using to unroot your Galaxy S5, and it requires that you have the latest superuser binaries installed before it will run. 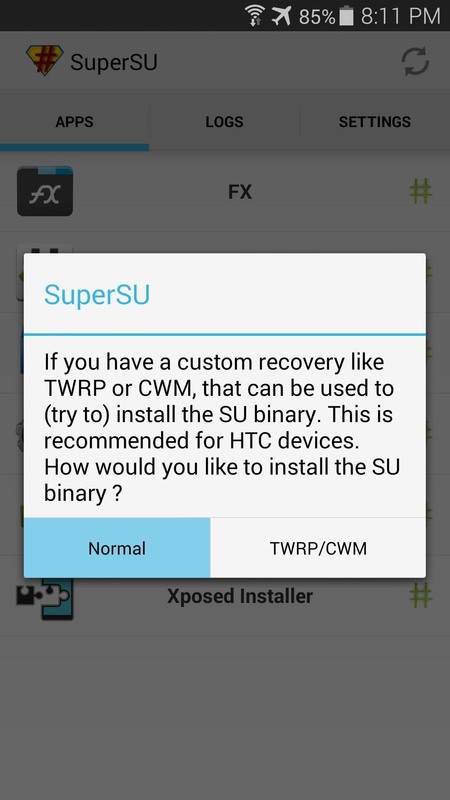 So open up the freshly-installed SuperSU app on your phone, and you'll be greeted by the message asking you to update the binaries. Tap Continue on this message, then choose Normal as the method of installation on the following menu. After about a minute of processing, you'll get a message asking if you want to delete Knox. Press Cancel here, then you should see a confirmation dialog that lets you know the binaries were updated and a reboot is needed. Go ahead and reboot your phone at this point. When you've booted back up (or if you've already taken care of the first two steps previously), you can go about the process of actually unrooting your phone. 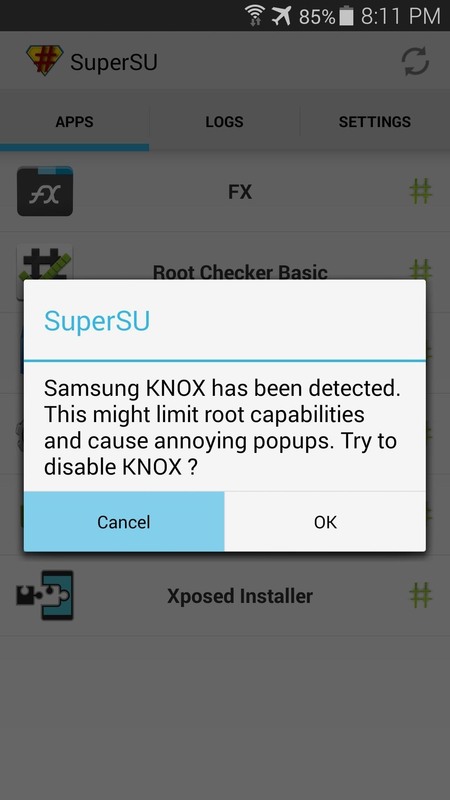 Open the SuperSU app, and it will ask if you want to delete Knox again, so press Cancel. Next, tap the Settings tab near the top of the screen. From here, scroll down the list until you find an entry titled Full Unroot. Tap this option, then hit Continue on the next menu. After a few moments, the app will close out without any confirmation dialog. At this point, you're already unrooted. Just reboot your phone so that the changes can take effect. 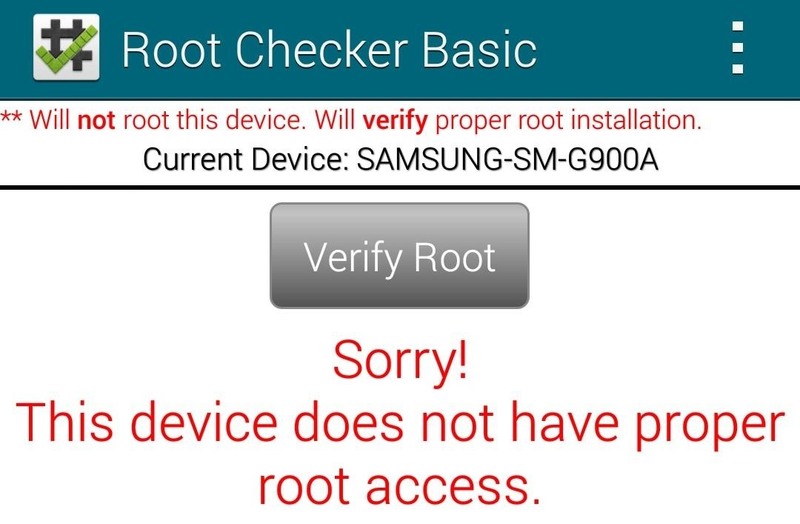 When you get back up, download Root Checker from the Play Store to verify that your phone is indeed no longer rooted. I told you it was easy, didn't I? How long did it take you to unroot your Galaxy S5? Let us know in the comments section below. If I unroot will the bloatware apps I deleted stay deleted? Yes. Everything will remain exactly as you have it set up right now, you just won't be rooted. Everything will stay the same as it is, so I don't need to back all the files and apps do I? Nope, you don't have to back anything up. All this will do is unroot your S5, so nothing else it as risk. Dallas, what about the SPDClient.apk? Do I need to change it back? If I want to root again with Towelroot will I be able? You don't need to put the SPDClient.apk file back into its original location unless you want to be fully stock when you finish unrooting. If you decide to put that file back, you'll have to do that before you unroot, since you won't be able to access that file's original folder without root privileges. If I want to root again with Towelroot will I be able? Yes, Towelroot will work again just the same. Sorry I didn't mention that last time, I guess I got carried away in answering the first part of your question and forgot to answer the last part. I have an issue where my phone is lagging and my S Health doesn't work. 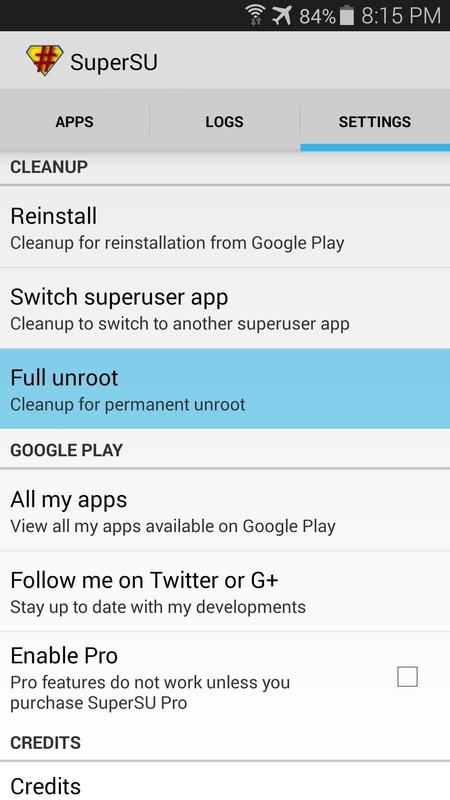 So I want to unroot it, will all the root files be gone? If I unroot after uninstalling bloat-ware and I want to return to full factory state (with the bloat-ware installed) what steps would I need to take? Would factory resetting it or flashing a factory rom work? Hey guys I have I'm trying to rename the SPDClient.apk to SPDClient.apk.bak but every time it says "Woops, something went wrong". Any suggestions?? Sadly i been having errors like Private mode not working and unable to update OS. I hit ok on the uninstal the knox.... any fix? I have same question as Jo Belog? hello please help me.my apps supersu cant working.why?? anyone can help me for this problem..i needed your help!! Will this unroot method work if I used CF-autoroot to gain root access? What I can find regarding that says it requires a full system reset to unroot. It depends on what you want to unroot for. 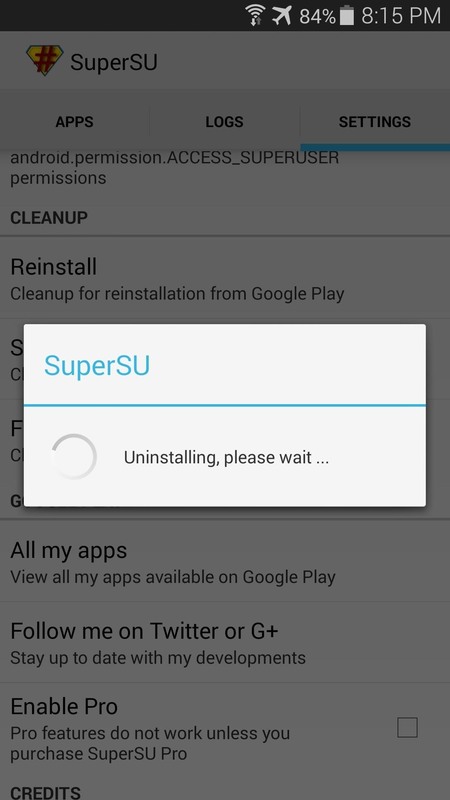 If you're unrooting to remove Superuser access from all Android apps, this method will work. But if you want to undo everything that the rooting process did in an effort to completely restore your device's firmware to its stock state, you'd probably have to restore the factory firmware. CF Auto Root transfers some root-related files to your system partition, and this process won't remove those. Also, if you used root privileges to make any changes to your firmware (remove apps, install custom recovery/kernel, various other mods), this process won't undo those changes. For a guide on restoring the factory firmware, which would leave your device exactly as it was when you took it out of the box, check out this link. Darn. I still am unable to run standard system OTA updates. Guess I need to go old school and wipe it clean. thanks i recently rooted my Galaxy Note 3 to android v4.4 and it's working really great..cheers! Can you give me some advice !! I've had that happen to me before, and in the end, I'm not quite sure what fixed it. Some of the things I did that could have fixed it: Updated the SuperSU app (through the Play Store), updated the binaries (through the updated SuperSU app), then rebooted and it finally worked. Have you tried clearing the data on the Good for Enterprise app? You can do that by going to Settings -> Application Manager, then selecting the Good for Enterprise app. From there, tap "Force Stop", then hit "Clear Data" and reboot your phone. If it's still not working, let me know and we can go over some more troubleshooting options. 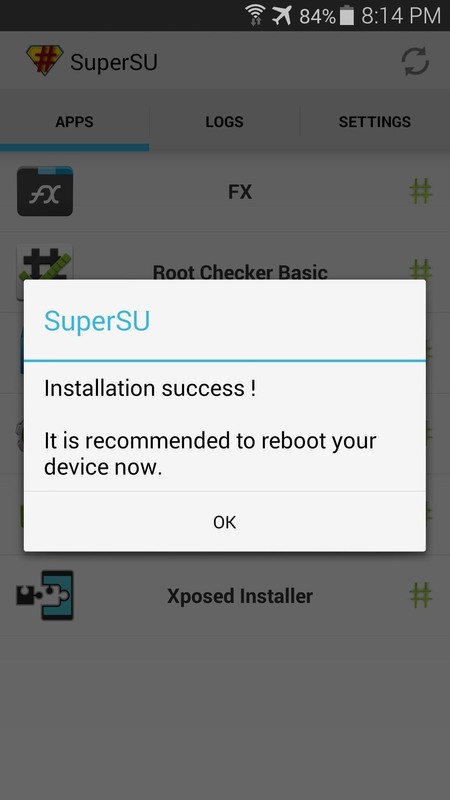 Hey, I rooted my s5 using towel root a while back and then deleted supersu etc because didn't need it any more, then banking apps refuse to work on my phone because it is a "rooted device". So I redownloaded the app supersu and rootchecker. Only to find rootchecker saying: "Sorry! Root access is not properly installed on this device. 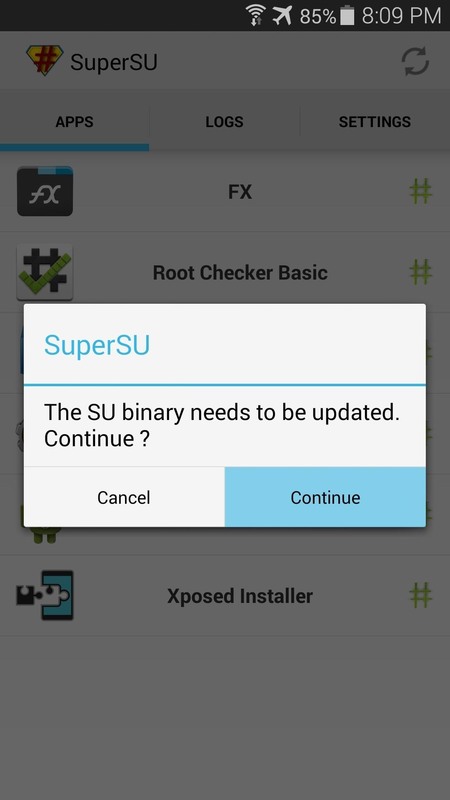 Android version 4.4.2"
"There is no SU Binary installed, and SuperSU Cannot install it. This is a problem! If you just updated to android 4.3, you need to manually re-root - consult the relevant forums for you device!" What do I do?! I need to unroot to be able to use my banking apps etc.